The week’s weather was pleasant but having a 30-hour cold front that brought some heavy rain & winds. The fishing however stayed very good as you will see below. SB between 15-18” plus 30-40 Pike. 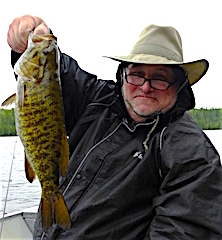 5th day the Smallmouth were hot on Top-water catching over 30 plus 40 Northern Pike. 6th & final day was a good finish catching close to 50 Northern Pike and each caught another Muskie making the week total 11 Muskie landed including a 40, 41, 44”. Before leaving they made their 2017 reservations. 2 over 18”, nothing under 15” & most were 17” plus. 3rd day was another good day despite a cold front moving in all catching many Smallmouth Bass along with some Northern Pike. 4th & Final day all did great catching 30-40 fish per boat; mostly Smallmouth Bass & Al caught another Muskie. Long time Guests Walt LaCasse, John Hietala, Waysata & Northfield, MN, Ronnie Ditillo Pittsburgh, PA & Jim Jones McKinney, TX were returning for their 18th year. 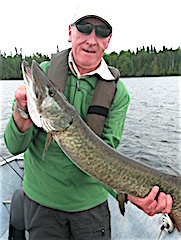 1st day was very good catching between 15-20 fish per boat being a mix of NP & SB plus Walt caught a 35” Muskie. 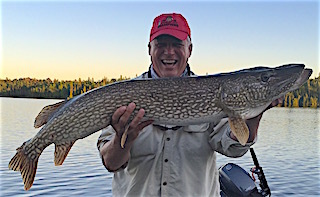 2nd day Walt & John had a banner day catching well over 50 Northern Pike using the wind to their advantage fishing in a wind blown bay having several doubles & even a triple as John caught 2 while Walt was catching 1. 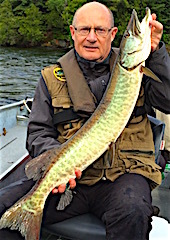 Also John missed on the biggest Muskie he has seen. 3rd day was good fishing in cold front conditions catching many Smallmouth Bass & Pike. 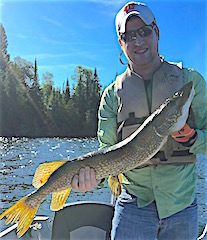 4th & final day was a good day for all catching Pike & Smallmouth Bass with each boat catching 20-25 fish. the bush and solitude of the lake plus caught 60 Northern Pike, a PB for all. 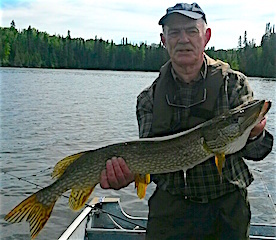 4th day Norman had a BIG Fish day catching a 37” Muskie & 36” Northern Pike plus they caught over 20 fish total. 5th day was like nothing they ever experienced before catching over 90 Pike. 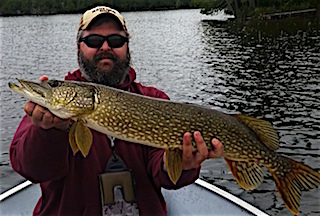 6th day had them having another bang up day catching well over 60 Northern Pike in search of the BIG fish. 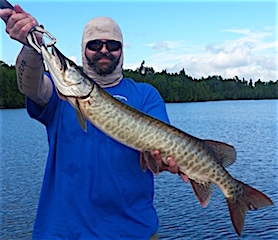 7th day was very windy but they managed to catch some nice fish including Steve’s PB landing a BIG 37” Muskie off a lure purchased from my tackle shop that very morning. 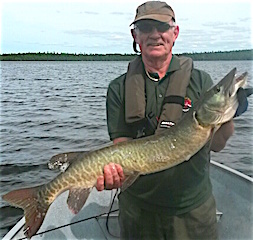 8th & final day they were shooting for Muskie and were successful, Norman catching the best fish at 36-inches. 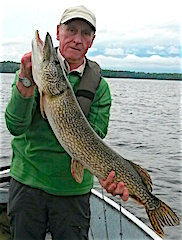 Totals for the week were 289 Northern Pike 4 Muskie, & 14 Smallmouth Bass, which was their PB for a fishing trip. All left having had a great holiday and said that they will be back. Cousins Frank Kerr from Plainfield, IN & Doug Kerr from Henrico, NC returned for the 6th consecutive year with Greg Stowe also from Henrico. DOA they started with 20 Smallmouth Bass. 1st full day was a surprise as they caught 58 Smallmouth Bass despite a cold front, rain and wind, with a lot 15-17 & Greg landed a BIG Trophy 19”. 2nd day was even better catching 65 Smallmouth Bass 15-19” Greg with another 19”. 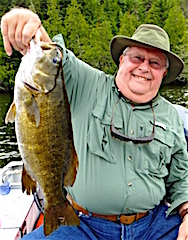 4th day was incredible as they caught 87 Smallmouth Bass with 90% being 15-18” & Doug had a HUGE Trophy at 20”. 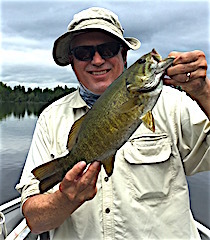 5th & final day was another good day catching 51 BIG Smallmouth with both Doug & Frank both catching 20-inch Trophies. Total was 331 Smallmouth Bass. All left having a great trip already planning for 2017. Al & Aylin Abayrak from Charlotte, NC were excited to be visiting us for the 1st time. These two had a great 1st day exploring catching some fish along the way. 2nd day was even better as they caught Northern Pike with a few Bass mixed in, Al landing a 35” & Ailylan had a huge fish follow. 3rd day they did great catching Pike & Bass, Al landing a 36” Pike & Aylin caught a trophy 18” Smallmouth Bass & was all smiles in the dinning room. 4th & final day was great as they caught over 30 Smallmouth Bass, really getting down the technique of fishing the sinking worm. Both thoroughly enjoyed their experience and hope to return. 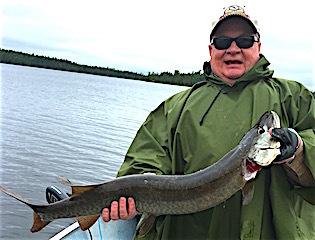 Doug & Mary Bergman returned for their 5th visit bring their son Brett & his good friend Ben Zordani all from New Lenox, IL DOA Mary got right to where she left off in 2014 landing a nice Tiger Muskie. 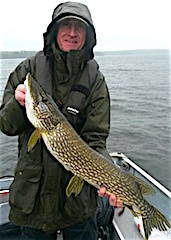 1st day they struggled through cold front conditions with some heavy rain catching 8 Smallmouth and a few pike. 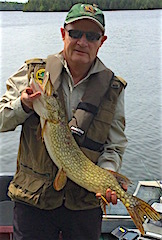 2nd day was spent catching a mix of Smallmouth & Pike plus Muskie Mary did it again landing a barred Muskie. 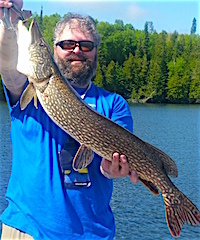 3rd day proved to be tremendous, catching 101 Northern Pike. 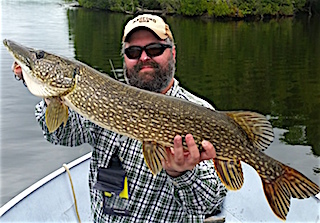 4th & final day was a HUGE day catching day as Doug & Mary caught 131 Pike with Brett & Ben landing 50. Doug & Mary’s departing words were “We plan to see you Next Year”. 4th time return Fly Fishers from the Greater Toronto Area Jeff Chisholm son Brian, Alan Paxton, Bud McLaine, Jeff’s other son Matt, Rowley, MA & Charlie Piermarini, Chicago, IL 1st day was fabulous fly-fishing with each boat catching 25-30, mostly BIG Smallmouth Bass up to 5lbs & a few Pike. 2nd day was very similar to the first with Jeff & Charlie also catching some Pike. 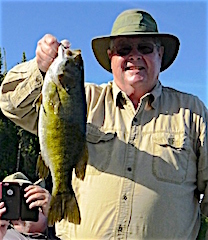 3rd day by noon each Bud & Alan caught 6-8 Trophy Smallmouth Bass 4-5lbs lost almost as many. Jeff, Charlie, Brian, and Matt all had a good day Smallmouth fishing catching over 20 per boat with many being large in the 17 inch class. 4th & last day was great as Jeff & Charlie caught 40+ Northern Pike Fly Fishing, Brian & Matt did about the same with Bud & Alan staying after the Smallmouth having another good day.